Registration for this event is now open. Places are free but booking is essential. Please register here. During this event, Dr Hugo Leal and Dr Hugo Drochon will launch the results of a substantial survey on the topic of conspiracy and democracy. The survey “Conspiracies”, commissioned to YouGov-Cambridge Centre, is the most comprehensive cross-national study ever conducted combining public perspectives on conspiracy theories, news consumption, social trust and ideological affiliation. It was fielded in nine countries, including Great Britain and the USA, and covers contentious issues, such as anti-immigration sentiments, Islamophobia, anti-Semitism, vaccine scepticism and climate change denial. 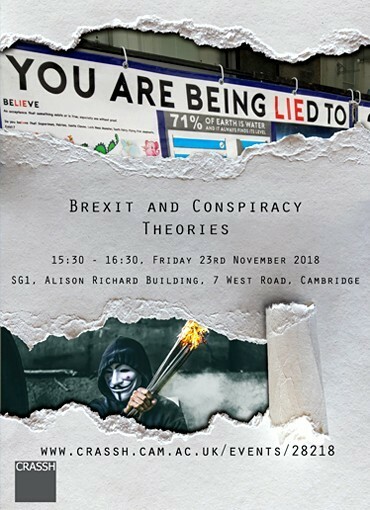 The event will examine the results of the survey and reveal the associations between some of the most momentous events in contemporary history, like the election of Donald Trump and the Brexit vote, and conspiratorial beliefs. Are Brexit and Trump supporters more likely to be conspiracy theorists? Is consuming news on social media correlated with conspiracy beliefs? The answers to these and other important questions will be given during the event. This public launch is associated with a separate full-day event, Conspiracy and Democracy: History, Political Theory and the Internet. If you are registered to attend the full-day event, you do not need to register to attend this event. If you wish to attend only the launch from 15:30 to 16:30, please register using this form. • Part of the Conspiracy and Democracy research project funded by The Leverhulme Trust.